Rizal had his early education in Calamba and Biñan. It was a typical schooling that a son of an ilustrado family received during his time, characterized by the four R's- reading, writing, arithmetic, and religion. Instruction was rigid and strict. Knowledge was forced into the minds of the pupils by means of the tedious memory method aided by the teacher's whip. 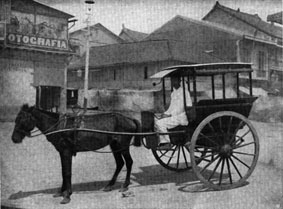 Despite the defects of the Spanish system of elementary education, Rizal was able to acquire the necessary instruction preparatory for college work in Manila. It may be said that Rizal, who was born a physical weakling, rose to become an intellectual giant not because of, but rather in spite of, the outmoded and backward system of instruction obtaining in the Philippines during the last decades of Spanish regime. His first teacher was his mother, who was a remarkable woman, she was of good character and fine culture. On her lap, he learned the alphabet and the prayers already at the age of three . "My mother," wrote Rizal in his student memoirs, "taught me how to read and to say haltingly the humble prayers which I raised fervently to God." As tutor, Doña Teodora was patient, conscientious, and understanding. It was she who discovered as first that her son had a talent for poetry. Accordingly, she encouraged him to write poems. To lighten the monotony of memorizing the ABC's and to stimulate her son's imagination, she related many stories. One evening she told him the Story of the Moth. As José grew older, his parents employed private tutors to give him lessons at home. The first was Maestro Celestino and the second, Maestro Lucas Padua. Later, an old man named Leon Monroy, a former classmate of Rizal's father, became the boy's tutor. This old teacher lived at the Rizal home and instructed José in Spanish and Latin. Unfortunately, he did not lived long. He died five months later. After a Monroy's death, the hero's parents decided to send their gifted son to a private school in Biñan. On a Sunday afternoon in June , 1869, José, after kissing the hands of his parents and a tearful parting from his sister, left Calamba for Biñan. He was accompanied by his brother Paciano, who acted as his second father. The two brothers rode in a carromata, reaching their destination after one and one-half hours' drive. They proceeded to their aunt's house, where José was to lodge. It was almost night when they arrived, and the moon was about to rise. That same night, José, with his cousin named Leandro, went sightseeing in the town. Instead of enjoying the sights, José became depressed because of homesickness. "In the moonlight," he recounted, "I remembered my home town, my idolized mother, and my solicitous sisters. Ah, how sweet to me was Calamba, my own town, in spite of the fact that was not as wealthy as Biñan." The next morning (Monday) Paciano brought his younger brother to the school of Maestro Justiniano Aquino Cruz. The school was in the house of the teacher, which was a small nipa hut about 30 meters from the home of José's aunt. Paciano knew the teacher quite well because he had been a pupil under him before. He introduced José to the teacher, after which he departed to return to Calamba. Immediately, José was assigned his seat in the class. The boys in the class, especially Pedro, the teacher's son laughed at José's answers. The teacher sharply stopped all noises and begun the lessons of the day. José described his teacher in Biñan as follows: "He was tall, thin, long-necked, with sharp nose and a body slightly bent forward, and he used to wear a sinamay shirt, woven by the skilled hands of the women of Batangas. He knew by heart the grammars by Nebrija and Gainza. Add to this severity that in my judgment was exaggerated and you have a picture, perhaps vague, that I have made of him, but I remember only this". First School Brawl. In the afternoon of his first day in school, when the teacher was having his siesta, José met the bully, Pedro. He was angry at this bully for making fun of him during his conversation with the teacher in the morning. José challenged Pedro to a fight. The latter readily accepted, thinking that he could easily beat the Calamba boy who was smaller and younger. The two boys wrestled furiously in the classroom, much to the glee of their classmates. José, having learned the art of wrestling from his athletic Tio Manuel, defeated the bigger boy. For this feat, he became popular among his classmates. After the class in the afternoon, a classmate named Andres Salandanan challenged him to an arm-wrestling match. They went to a sidewalk of a house and wrestled with their arms. José, having the weaker arm, lost and nearly cracked his head on the sidewalk. In succeeding days he had other fights with the boys of Biñan. He was not quarrelsome by nature, but he never ran away from a fight. His way life was methodical and well regulated. He heard mass at four if there was one that early, or studied his lesson at that hour and went to mass afterwards. Returning home, he might look in the orchard for a mambolo fruit to eat, then he took his breakfast, consisting generally of a plate of rice and two dried sardines. After that he would go to class, from which he was dismissed at ten, then home again. He ate with his aunt and then began at ten, then home again. Then began to study. At half past two he returned to class and left at five. He might play for a short time with some cousins before returning home. He studied his lessons, drew for a while, and then prayed and if there was a moon, his friends would invite him to play in the street in company with other boys. Whenever he remembered his town, he thought with tears in his eyes of his beloved father, his idolized mother, and his solicitous sisters. Ah, how sweet was his town even though not so opulent as Biñan! He grew sad and thoughtful. While he was studying in Biñan, he returned to his hometown now and then. How long the road seemed to him in going and how short in coming! When from afar he descried the roof of his house, secret joy filled his breast. How he looked for pretexts to remain longer at home! A day more seemed to him a day spent in heaven, and how he wept, though silently and secretly, when he saw the calesa that was going to take me. Than everything seemed to me sad, I picked a flower, a stone that attracted; a flower that he touched, a stone that attracted his attention he gathered, fearful that he might not see it again upon his return. It was a sad but delicate and quite pain that possessed him. The boy José distinguished himself in class, and succeeded in surpassing many of his older classmates in Spanish, Latin, and other subjects. Some of his older classmates were jealous of his intellectual superiority and they were so wicked that, even without reason, they accused him before the teacher, for which, in spite of his progress, he received many whippings and strokes from the ferule. Rare was the day when he was not stretched on the bench for a whipping or punished with five or six blows on the open palm. José's reaction to all these punishments was one of intense resentment in order to learn and thus carry out his father's will. José had a very vivid imagination and a very keen sense of observation. At the age of seven he traveled with his father for the first time to Manila and thence to Antipolo to fulfill the promise of a pilgrimage made by his mother at the time of his birth. They embarked in a casco, a very ponderous vessel commonly used in the Philippines. It was the first trip on the lake that José could recollect. As darkness fell he spent the hours by the katig, admiring the grandeur of the water and the stillness of the night, although he was seized with a superstitious fear when he saw a water snake entwine itself around the bamboo beams of the katig. With what joy did he see the sun at the daybreak as its luminous rays shone upon the glistening surface of the wide lake, producing a brilliant effect! With what joy did he talk to his father, for he had not uttered a word during the night! When they proceeded to Antipolo, he experienced the sweetest emotions upon seeing the gay banks of the Pasig and the towns of Cainta and Taytay. In Antipolo he prayed, kneeling before the image of the Virgin of Peace and Good Voyage, of whom he would later sing in elegant verses. Then he saw Manila, the great metropolis , with its Chinese sores and European bazaars. And visited his elder sister, Saturnina, in Santa Ana, who was a boarding student in the Concordia College.